Welcome to Woodridge, Washington, DC! Enjoy this fully renovated spacious light filled all-brick home with over 3,000 s/f of living space across FOUR finished levels w/ ALL NEW systems, hardwood floors, 9ft ceilings, new (sash) windows and more. 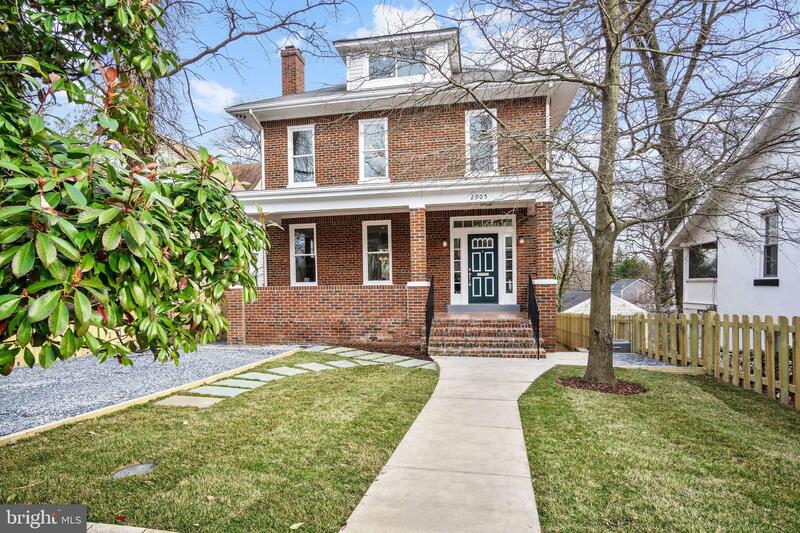 Built in 1924 and FULLY renovated in 2019, you must see the THREE covered porches and huge back yard while you visit. Check out the 425 s/f master suite with its own sunroom, WIC, & luxury bath plus FIVE additional bedrooms, FOUR full baths and a powder room! This is one big beautiful home! Enter from the huge front porch, through a gracious foyer, and enjoy the formal living room w/ wood-burning fireplace and access to open-concept dining/kitchen areas. French doors open onto a covered rear porch from the dining room and allow for fabulous back yard views. The gourmet kitchen is appointed w/ quartz countertops, stainless steel appliances, gas range, a range hood to clear your kitchen air, custom cabinets, extra storage and an adjacent mudroom. A powder room completes the main living space. The fully finished lower level, w/ walk-out access to the back yard, another covered porch, has a family room, bonus room/office space, a full bath and laundry center. The TWO upper levels house the master suite, FOUR additional bedrooms and three full baths. Loads of natural light enhance the sunroom, high ceilings, and views. This deep lot is over 9,500 square feet that feels like a park in the middle of city, and has mature trees, space for your urban garden, space for a play area or pool, brick paths and a flagstone patio! Enjoy NEW dual zone heating and cooling. Rest assured that your full French drain and sup pump will keep things dry for years to come. This home has the space and features to set it apart from its competition. Come take a look! Under ONE mile to a Capital Bike Share station. Under TWO miles to Metro, shopping, Starbucks, Atlas Brewery, Menomale, Brooklands Finest, Right Proper Brewing, DC Brau and more. Union Market, Trader Joes, National Arboretum and Hyattsville Arts District are under THREE miles away. © 2019 Bright MLS. All rights reserved. Information Deemed Reliable, but Not Guaranteed. Listing information is from various brokers who participate in IDX and not all listings may be visible on the site. The property information being provided is for consumers personal, non-commercial use and may not be used for any purpose other than to identify prospective properties consumers may be interested in purchasing. Listing courtesy of Keller Williams Capital Properties. Data last updated on Wednesday, April 24th, 2019 02:31:03 AM.